The god Ullr is another of Norse myth’s enigmatic gods, along with Heimdall. Both seem to have faded in importance by the time that the myths were being written down, although people in Sweden and Norway worshipped Ullr, and we know that invoked him when they swore oaths. He is clearly a god of winter and winter pursuits, which has led to a rebirth of sorts in the Ullr Fest held in Colorado each winter. How should Ull be referred to? By calling him the son of Sif, the stepson of Thor, the god with skis, the god with a bow, the hunting god and the god with a shield. Which would make him an Æsir by adoption, at least. No source remains to tell us who his father was, although theories abound, all the way from Odin to a frost giant. 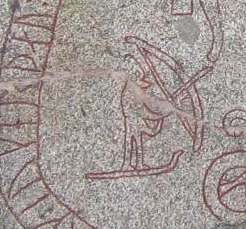 In Sweden there are 37 Ullevi, or Ullr’s vi (“sacred enclosure”), while in Norway you often get names based on Ullin, which seems to go on the same principle as Oðr – Oðin.3 A listing of place-names is available in the Wikipedia entry for Ullr. Ullr with bow and skis. Skadi also has some places named for her in Scandinavia, such as Skadevi (Skadi’s temple) and Skadalund. (Skadi’s grove) It’s difficult to say for sure with many place-names, because the ska- element is common in Scandinavian languages. de Vries thinks her places are mainly in eastern and mid-Sweden, and southeastern Norway. Like Ullr, her places are near those of Njord and Frey, which makes sense. There is one called Ull, the son of Sif and stepson of Thor. He is such a good archer, and so good on skis, that none can compete with him. He is also fair of face and has the ability of a warrior. It is good to call on him in a duel. when they lift off the kettles. It has been suggested that this latter verse refers to some sort of divination or trancework that involved steam. Still, it’s interesting that Ullr’s favour would be enough incentive for Odin to offer it to a total stranger, and that he lists Ullr ahead of all the other gods. by the marital bed and by Ull’s ring. Grimnismal and Atlakvida are considered to be amongst the oldest Eddic poems, which may explain why they are the only ones to mention Ullr. But off the inmost house was there another house, of that fashion whereof now is the choir of a church, and there stood a stall in the midst of the floor in the fashion of an altar, and thereon lay a ring without a join that weighed twenty ounces, and on that must men swear all oaths; and that ring must the chief have on his arm at all man-motes. Arnkel the Priest went to the doom and made oath on the stall-ring that Geirrid had not wrought the hurt of Gunnlaug; Thorarin made oath with him and ten other men, and then Helgi gave the verdict for Geirrid. And the case of Thorbiorn and Snorri came to nought, and thereof gat they shame. There were gold or silver ones that were kept in temples, which always should be sworn on before legal proceedings6, although kings at one time had their own, usually set into a sword hilt. Archaeologists excavating at Lilla Ullevi (Ull’s vi) found 65 amulet rings.They don’t look like oath-rings, so I wondered if they weren’t a symbol of Ullr himself. Or maybe offerings after a successful court case or duel. Apart from this, Ullr makes one other appearance as Ollerus in Saxo grammaticus’ Gesta Danorum (History of the Danes). In that story, Odin is the king of the gods in Byzantium, but is forced into exile after he dresses up as a woman to get close the king’s daughter Rind, on whom he gets Baldr’s avenger. After 10 years Odin returns, and now Ollerus is forced into exile and killed. The story goes that he was such a cunning wizard that he used a certain bone, which he had marked with awful spells, wherewith to cross the seas, instead of a vessel; and that by this bone he passed over the waters that barred his way as quickly as by rowing. Ollerus may very well have been using skates with bone blades, as they were known back then. (They’ve been found at Dublin and York, and dated to the 11th or 12th century). They were tied on to the owner’s shoes, rather like the first (metal) skates I had as a child. So we know he used skis, and now skates. Combine this with Snorri’s mention of a kenning of “Ullr’s ship” for a shield, and have a primitive snowboarder as well. Ullr on his magical bone – from Olaus Magnus’s book. Single skates were common until the 20th century in northern Europe. Putting together Ollerus, Ullr, Ullin and Old English Wuldor, we get an etymology of “Glory”, which some have traced to the aurora borealis. It’s certainly the grandest thing you can see in the winter sky, and should have a god of its own. which translates as “Glory-Servant Not-Poorly-Famed”.7 Svartesol also suggests “Wulthoraz the Well-Famed”, which could also work.8 McLeod and Mees9 do not see it as necessarily relating to Ullr, but considering how many kennings for warriors and swords have the Ull- element, it fits. Ullr float at Ullr Fest. Nor is Ullr so poorly famed in one sense, at least. Google him and you’ll find the Ullr Fest, which is a week-long event held in Breckenridge, Colorado to celebrate “the god of snow”, and bring snow to the town. No other Norse deity has such a public, and generally popular, festival. Maybe the obscure god is having the last laugh on those who displaced him. Snorri Sturluson/ Jesse Byock (trans.) 2005:The Prose Edda Jesse Byock (trans. ), Penguin Classics. Carolyne Larrington (trans.) 1996: The Poetic Edda, Oxford UP. Lindow, John, 2001: Norse Mythology: A Guide to the Gods, Heroes, Rituals and Beliefs, Oxford UP. McLeod, Mindy, and Bernard Mees, 2006: Runic Amulets and Magic Objects, Boydell Press, London. Nielsen, Niels Age, 1969: “Frey, Ull, and the Sparlosa Stone” Mediaeval Scandinavia 2: 102-28. Simek, Rudolf (trans. Angela Hall), 1996, Dictionary of Northern Mythology, D. S. Brewer, Cambridge. Svartesól 2009: Visions of Vanaheim, Lulu Enterprises Inc. 860 Aviation Parkway, Suite 300, Morrisville, NC 27560. This entry was posted in Mythology, Norse and tagged archer, north, runes, Ullr on February 19, 2015 by solsdottir.